One Line Summary (91/100): A fantastic addition to (one of) the best fantasy RTS games! After the devastating war fought at Mount Hyial all the races have retreated to their lands in order to recover from there losses. But the new king of the undead, Arthas will not leave it like this. In order to rule the entire world of warcraft he has begun a search for the Frozen Throne. Is there any way to stop this fearsome warrior? And where is the escaped warrior Illidian? Since gameplay hasn’t drastically changed by the expansion, this will be a description of Warcraft III gameplay. Warcraft is one of (if not the) best RTS games ever! The four races are great and all have their weak and strong sides they’re well-balanced. Another great aspect are the heroes. The hero system of warcraft was the first apperance fo such a system and has been copied numerous times simply because it’s great. The four spells and you being able to chose which one to develop at each level gives the feeling he is really a special unit. Losing the spells or the fact that you can chose which one he should learn would demote the heroes to no more then a strong unit. In Frozen Throne 1 hero has been added to each race and 5(now 8 due to patches) new heroes can be hired in the tavern. What else is great about warcraft? The campaigns are awesome. The mission vary enough so you can never get bored. There are missions with only heroes (and a few units) or missions where you have a camp and set up your army yourself. The use of items has been expanded in The Frozen Throne. Every race has a shop now where heroes can purchase new items and potions. The items that can be bought in the shops vary for each race. And even normal units can buy items now. When you’ve completed an upgrade some units will get two item sockets. Warcraft has an excellent multiplayer mode. Battle.net is the great system that provides such smooth and free online play. Up to eight players can join up and fight 4vs4 matches. And up to twelve players can play together in custom games. Custom games are maps made by players and offer all new experiences to Warcraft. This way you’ll never get tired of playing online. But the costum maps don’t limit to RTS types of games. The hero system allows RPG experiences as well! The graphics of Warcarft are known even in the most far corners of the south pole (or so I’ve been told). The “cartoonish look” can charm any gamer and makes the game attract an even bigger public. The graphics were of the finest when warcaft was released. At the release of Frozen Throne the graphics still look good but they have been surpassed by other. Today the graphics are not the best anymore but due to the fantastic effects for spells and attacks and the “cartoonish look” they remain attractive. In fact, the cartoonish "cellshaded" look has become a fan of most warcraft players and look forward to it greatly in World of Warcraft. The Night Elves are masters in ranged combat. I have found that to be very successful with race, you need a high amount of microing. Coming from their green homelands of Ashenvale and northern kalimdor, they have been disturbed by the forces against them and feel a calling to defend their homeland at all costs. Armed with skilled archers and druids, the n-elf prove a worthy enemy and they use their blend and scout ability to their advantage, finding the right time and place to attack to bring their enemy to nothing. A swift flying unit with a colorfull appearance. The Faerie Dragon is an excellent addition when opposed against enemy casters. The mountain giant is feared in every single region. This huge stone unit can take an enormous amount of damage before going down. His taunt spell forces enemies to attack him, thus saving the health of the relative weak ranged units. The warden is a very strong willed character and you can learn a lot about her from the warcraft single player. She is a very offence orientated hero and her attacks are very powerful. Her first ability is the fan of knives. it affects the enemies near by the warden and deals an instant damage to them. this is a brilliant attack when used against low level creeps and units. Her second attack is a very useful move and can get her out of sticky situations. The blink move gives the warden the ability to teleport a short range in an instant (the blink of an eye). Her third move is a very deadly poison dart which deals immediate damage to the recipient and then deals a certain amount of damage over a period of time, depending on the level of the attack. Her final, level 6, attack summons a avatar of vengeance which in turn summons smaller minions to fight for it. These minions are invulnerable however the avatar is not. Filthy Humies! . These are your most awkward race in my opinion, they are very high demanding of you and if you don’t know what you are doing then you are in trouble with the humies. They are a quite advanced race using magic and gnome mechanical technology to their best advantage. Trying to rid their homelands of the green skinned orcs and more recently the undead race which plague their land to the north, the humans face peril everyday and we can but only see whether you choose them to succeed! A elven warrior that has grown up with magic. He is immune to magic himself but his various spells allow him to take advantage of the enemy his magic abilities. Another elven warrior that has reinforced the human armies. The Dragonhawk Rider mounts his dragonhawk and is an excellent unit against other flying units. His fog ability makes him very effective at stopping towers. This human hero is a member of the blood elves. Allied with humans against teh scourge the blood mage proves himself worthy with a powerful Area of Effect attack and when combined with that of the archmage the damage often results in fatalities. The mage is also equipped with a banish move which makes units unable to attack and reduces their movement speed greatly. In this state they cannot be attacked but they are susceptible to magic attacks. The third attack of the blood mage is a mana drain and is fairly obvious how this works, it has good range and can be a useful attack if used wisely. The level 6 attack of this character is the phoenix, a massive firey bird which is invulnerable in its bird form. It lasts 60 seconds or so and then forms into an egg where it is vulnerable to attacks for 10 seconds, should it be alive after this time, the phoenix then returns to bird state to deal an incredible amount of damage. Orcs, the savage beasts that crowd the forest. Forced to flee their homeland to reach the wastelands kalimdor, the orcs and trolls joined forces with the taurens of kalimdor and they have proven a worthy ally in their struggle against the eyes of the forest (n-elves). Equipped with amazing brute force and mysterious magic, the bloodthirsty show no mercy in wiping their rivals out and spare no expense to preserve the growth of the horde. A troll mounted on a bat with some Molotov cocktails. This unit can destroy buildings in no time but it’s pretty weak against any other unit. The Spirit Walker is a druid with a ghostly form. He can’t be harmed by any physical damage nor can he deal any damage until he takes his physical form. His “Ancestral Spirit” spell allows him to resurrect a tauren warrior. The orc new hero is a caster hero and sounds like a rastafarian. He is a member of the more reclusive troll section to the horde and is not strictly a greenskin. His first attack is a healing wave which bounces off more than one friendly unit healing less every time it bounces. This proves very useful when healing heavy units. Secondly the shadow hunter has Hex, which is a rather interesting attack as it turns the enemies of the shadow hunter into a random animal for a short period. The third attack of the troll hero is a serpent ward which when summoned is fixed to a position and attacks units in the surrounding area. The best thing about this attack is that the shadow hunter can summon multiple serpents which is very useful when trying to confuse foes. The level 6 attack of this hero is a very powerful attack and makes everyone in the area around the hero invulnerable to all attacks for a period of time. However during the BIG BAD VOODOO, the shadow hunter himself is not invulnerable and cannot move whilst casting the BBV. From the corpses of victims of the previous wars new undead warriors have been born. Driven by the force of once noble prince of the human race, the undead race have no purpose to defend any land as they are not indigenous to any part of the world as it is. Feeding of the flesh of their fallen comrades and the foes they have stricken down, the undead will not rest until they ridden the world of mortals. The obsidian statue is the backbone of any undead army. With his abilities to healh and replenish the mana of nearby units you can often find this unit in the background of an undead legion. A large flying unit that will terrify any enemy that dares to come near. The Destroyer is released out of the Obsidian Statue and he can attack both land and air units. The new undead hero is a member of the crypt fiend family and has become a favourite of many Undead users. Its abilities include a stun move which deals an amount of damage as well as stunning whoever lies in the path of the strike for a certain amount of time. It has also the infamous beetles which are summoned from corpses and last until the beetle is dead. The Crypt lord has a limit of 5 beetles at any one time. The third ability is a defence enhancer and is therefore passive. The Crypt lord has a very interesting level 6 attack as it deals damage to the units directly surrounding the crypt lord and in its close proximity. It consists of locusts releasing themselves from the crypt lord and gathering energy from other units and replenishing the life of the crypt lord. •	400 MHz Pentium II or equivalent, or a 400 MHz G3 processor or better. •	Warcraft III requires 128 MB of RAM. Virtual Memory should be enabled on computers running pre-Mac OS X versions of the Mac OS®. •	A keyboard and mouse are required. •	8MB 3D video card (TNT, i810, Voodoo 3, Rage 128 equivalent or better) with DirectX 8.1 support. For Mac OS® systems, a video card consisting of an ATI Technologies or nVidia chipset with at least 16 MB of memory is required. •	A DirectX-compatible 16-bit sound card is recommended. Warcraft III will work with the built-in sound features of the Mac OS®. Frozen Throne is a great expansion to a great game. Anyone who has Warcraft III Reign of Chaos should get this expansion and anyone who hasn’t got Warcraft III (shame on you) should get the battle pack with Warcraft III and The Frozen Throne. I urge all those heathans that have not tried this to try it and those who have tried it....read this review and see if you agree with what is said. Last edited by WNxThade; 12-27-2004 at 08:21 AM..
great job putting it all together thade...looks awesome. I am really impressed....great job dude. This review looks very nice. Just one thing- You don't need to give that much detail about the units . Nice review there m8 one thing i never realised was just how low the system requirements were for that game i though it was higher for some reason! u shouldnt advertise with screenshots of a 3 year old game but rest is good..
We reviewed the game because it was requested so please stop the "3 year old game"! 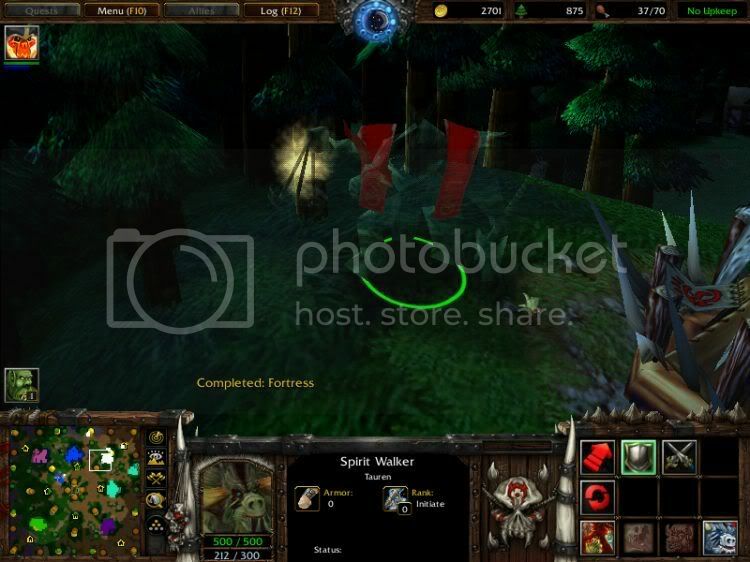 Wc3 TFT is a very good game though its 3 years old.There are many modifications for it and files to download on many websites to transform the game into final fantasy or smth else.There is even a CoD mod availible. The revue is good too, fits to the good game.